• Utah State will kickoff its 114th season of football on Thursday, Aug. 30 when it hosts Southern Utah at 6 p.m. USU is 494-507-31 (.494) in its previous 113 seasons. • Utah State will be opening a season at home for the first time under fourth year head coach Gary Andersen and for the 12th time since the 1959 season. Furthermore, USU will be opening a season with consecutive home games for the 25th time in school history, but for just the third time since the 1954 season as it hosts Utah on Friday, Sept. 7 at 6 p.m.
• Utah State is 36-14-1 (.716) all-time when it begins a season at home, and the last time it started a season at home was on Aug. 30, 2007 when it faced UNLV (L, 23-16). The last time USU started a season at home with a win was on Aug. 31, 1996 when it defeated Utah (20-17). Overall, USU has lost each of its last three home openers to start a season. 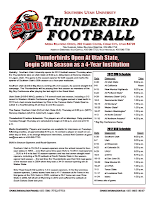 • Utah State is playing Southern Utah for the third time in series history and holds a 2-0 all-time record against the Thunderbirds as it defeated SUU, 30-14, on Sept. 7, 2000 and then posted a 53-34 win against SUU on Sept. 26, 2009, with both games being played in Logan. • Utah State has 55 players on its roster from the state of Utah, while Southern Utah has 45 players on its roster from the Beehive state. • Utah State head coach Gary Andersen spent the 2003 season as the head coach of Southern Utah, leading the Thunderbirds to a 4-7 record. Overall, Andersen is 1-0 in games versus Southern Utah with USU's 53-34 home win against the Thunderbirds on Sept. 26, 2009, which was his first home game at the Aggies' helm and his first USU win. • Utah State will be looking for its sixth-straight regular season win dating back to 2011 and that five-game regular season winning streak ranks tied for the eighth-longest active streak in the nation along with Baylor. LSU has the longest active regular season winning streak at 12, followed by Georgia (10), Arkansas State (9), Northern Illinois (9), Louisiana Tech (7), TCU (7), Virginia Tech (7), USU and Baylor. • Utah State has won each of its last two home games and is 10-7 at home under Andersen including a 5-1 non-conference record and a 3-0 record against in-state opponents. Those five non-conference home wins were against Southern Utah (53-34, 2009), Idaho State (38-17, 2010), BYU (31-16, 2010), Weber State (54-17, 2011) and Wyoming (63-19, 2011), while its one non-conference home loss was to Colorado State (35-34, 2OT, 2011). All-time, USU is 115-95 (.548) at Romney Stadium. Utah State will kickoff its 114th season of football on Thursday, Aug. 30 when it hosts Southern Utah on Merlin Olsen Field at Romney Stadium at 6 p.m. The game will be televised regionally on KMYU (Comcast Ch. 22, Dish Network Ch. 12, DirecTV Ch. 12, Over-the-Air 2.2) with Mychal Clanton (play-by-play) and Kevin White (analyst) on the call. Live audio and streaming of the game is also available on www.UtahStateAggies.com. Live stats will also be available through GameTracker, while Twitter updates - @USUFootball - will also be a part of Utah State's gameday coverage. Utah State returns 19 starters (O-8, D-6, S-5) and 44 lettermen (O-19, D-20, S-5) from last year's team that finished with a 7-6 record and tied for second-place in the Western Athletic Conference with a 5-2 mark as it participated in the Famous Idaho Potato Bowl (L, 24-23 vs. Ohio), its first bowl game since 1997. Highlighting Utah State's returners is junior center Tyler Larsen who earned first-team all-WAC honors a year ago. Along with Larsen, USU returns seven other starters on offense (WR-Matt Austin; WR-Chuck Jacobs; QB-Chuckie Keeton; QB-Adam Kennedy; LT-Oscar Molina-Sanchez; RT-Eric Schultz; RB/KR-Kerwynn Williams), six starters on defense (FS-McKade Brady; LB-Bojay Filimoeatu; DT-Al Lapuaho; CB-Nevin Lawson; LB-Tavaris McMillian; CB-Jumanne Robertson) and five special teams starters (P-Tyler Bennett; PK/H-Jaron Bentrude; KO-Jacob Haueter; LS-Nate Needham; PK-Josh Thompson). Along with playing in its first bowl game in over a decade during the 2011 season, Utah State's seven overall wins and five league victories were its most since 1993, while its second-place conference finish was its best since the 2000 team ended the year second in the Big West. Furthermore, those five league wins in 2011 were tied with five other teams (1953, 1960, 1990, 1991, 1993) for the most in school history, while its seven overall wins are tied for the 10th most all-time at USU. Utah State also won its final five games of the regular season in 2011, which is tied for the eighth-longest winning streak in school history and the longest since the 1993 squad won its final six games of the year. USU's three-win turnaround from four wins in 2010 to seven wins in 2011 was among the top 15 in the Football Bowl Subdivision for the year. Utah State lost five players who earned all-WAC honors in 2011 highlighted by senior running back Robert Turbin who was named the WAC's Offensive Player of the Year. Senior offensive lineman Philip Gapelu and senior linebacker Bobby Wagner both earned first-team all-WAC honors, while senior tight end Tarren Lloyd and senior defensive end Levi Koskan were both named to the second-team. Other offensive starters lost include guards Robert Hill and Funaki Asisi, wide receivers Stanley Morrison and Eric Moats, and running backMichael Smith. Other defensive starters lost include end Quinn Garner, linebacker Kyle Gallagher and safety Alfred Bowden. Utah State is entering its eighth and final year as a member of the Western Athletic Conference as it will officially join the Mountain West Conference on July 1, 2013. In its first seven years in the WAC, USU has posted an 18-37 (.327) mark. Prior to joining the WAC, Utah State was a member of the Sun Belt Conference from 2003-04 and spent two years as a independent (2001-02). USU was also a member of the PCAA/Big West Conference (1978-2000), the Mountain States Conference/Skyline (1938-61), and the Rocky Mountain Athletic Conference (1916-37). For the first time since 1996, Utah State will open a season with back-to-back home games, hosting a pair of in-state foes in Southern Utah on Thursday, Aug. 30 and Utah on Friday, Sept. 7. Both games are slated for 6 p.m. (MT) starts from Merlin Olsen Field at Romney Stadium. The Aggies' game against Utah will be on ESPN2. Overall, it is the first time in Coach Gary Andersen's four years at Utah State and just the 12th time since the 1959 season that USU has started its season at home. Furthermore, USU will be opening a season with consecutive home games for the 25th time in school history, but for just the third time since the 1954 season. Utah State's 2012 schedule features four teams who played in bowl games a year ago as Utah played in the Sun Bowl (W, 30-27 vs. Georgia Tech); Wisconsin played in the Rose Bowl (L, 45-38 vs. Oregon); BYU played in the Bell Helicopter Armed Forces Bowl (W, 24-21 vs. Tulsa); and Louisiana Tech played in the San Diego County Credit Union Poinsettia Bowl (L, 31-24 vs. TCU). Wisconsin is the only team on Utah State's 2012 schedule that finished the 2011 season ranked in the top 25 as the Badgers were No. 10 in the final Associated Press Poll, while BYU was ranked first among others receiving votes. Utah State will play three in-state games in 2012 as it hosts Southern Utah (Aug. 30) and Utah (Sept. 7) and plays at BYU (Oct. 5). The last time USU played three in-state teams in the same year was during the 2001 campaign when it played at BYU and Utah and hosted Weber State. Utah State head coach Gary Andersen made some changes to his staff following the 2011 season as quarterbacks coach Matt Wells was promoted to offensive coordinator, replacing Dave Baldwin, and former UNLV head coach Mike Sanford was hired as an assistant head coach working with the running backs and tight ends. Changes on the defensive side of the ball include hiring former Hawai`i defensive coordinator Dave Aranda as USU's defensive coordinator, a position that was held by Andersen last season. Utah State will playing on a new surface this fall after the installation of AstroTurf GameDay Grass 3D60 Extreme this past summer. USU's old synthetic Sprinturf had been in place since the 2004 season. Eleven former Utah State football players were on NFL preseason rosters as of July 30 including Diondre Borel (Green Bay), Jarrett Bush(Green Bay), John Chick (Jacksonville), Chris Cooley (Washington), Tarren Lloyd (New York Jets), Curtis Marsh (Philadelphia), Donald Penn (Tampa Bay), Patrick Scales (Baltimore), Michael Smith (Tampa Bay), Robert Turbin (Seattle) and Bobby Wagner (Seattle). Southern Utah returns 12 starters (O-5, D-5, S-2) and 40 lettermen (O-22, D-15, S-3) from last year's team that went 6-5 overall and posted a 1-3 mark in the Great West Conference to finish fourth. SUU also has 18 redshirts returning from last season to go along with 13 newcomers. Highlighting Southern Utah's 12 returning starters is senior quarterback Brad Sorensen who was named the Great West Conference's Most Valuable Player in 2011 as he completed 288-of-425 passes for 3,143 yards and 17 touchdowns. Also returning for the Thunderbirds on offense is junior wide receiver Fatu Moala who had 26 receptions for 370 yards in 2011. On defense, Southern Utah returns a pair of all-league performers from a year ago in senior end Cody Larsen and junior linebacker Chad Hansen. Larsen was second on the team a year ago in both sacks (6.0) and tackles for loss (7.5), while Hansen led the team with 104 tackles. Southern Utah is coached by Ed Lamb who is 21-23 in his first four years at the helm of the Thunderbirds. Utah State leads the all-time series against Southern Utah, 2-0, including a 53-34 home win on Sept. 26, 2009 in Gary Andersen's first home game as Utah State's head coach. The first meeting between the two teams was on Sept. 7, 2000, also in Logan, as USU notched a 30-14 victory. Utah State has several connections with Southern Utah including Gary Andersen who is in his fourth year in charge of the Aggies. Andersen began his head coaching career in 2003 at Southern Utah, leading the Thunderbirds to a 4-7 record after the team combined for a 3-19 record in its two previous years. USU linebackers coach Kevin Clune also coached at SUU in 2003 and 2004 as the Thunderbirds defensive coordinator. Furthermore, Southern Utah Athletics Director, Ken Beazer, spent four years (2002-05) in the Utah State Athletics Department as its Development Director. Brothers will square off against one another in the Utah State vs. Southern Utah game as USU junior center Tyler Larsen will face his older brother in senior defensive end Cody Larsen. Both brothers earned first-team all-state honors as prep players at Jordan (Utah) High School. Utah State is 75-17-6 (.796) all-time against current members of the Big Sky Conference with a 25-7 record against Montana, a 22-6-6 record against Montana State, a 14-2 record against Idaho State, a 12-1 record against Weber State, a 2-0 record against Southern Utah and an 0-1 record against Eastern Washington. 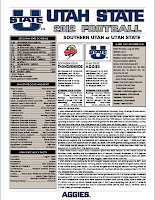 The last time USU faced a Big Sky school was on Sept. 10, 2011 when it defeated Weber State at home, 54-17. Gary Andersen is 3-0 versus current members of the Big Sky Conference as head coach of Utah State with wins against Southern Utah (53-34, 2009), Idaho State (38-17, 2010) and Weber State (54-17, 2011). Utah State is 1-5 all-time in games played during the month of August, including a 1-2 home record. USU is also 1-2 all-time in games played on Aug. 30, which is the second-earliest date it has ever opened a season (Aug. 28, 2003 at Utah). The Aggies last played on Aug. 30 in 2008 when it began that year against UNLV, losing 27-17 to the Rebels in Las Vegas. USU is also 1-4 in non-Saturday games under Andersen, including an 0-1 mark on Thursday as his first game as USU's head coach was on a Thursday at Utah to start the 2009 season. The other four non-Saturday games USU has played in during the last three years have all been on Friday as three of those games were against BYU, while the other was versus Boise State. Utah State is starting a season against a Football Championship Series (FCS) team for the first time since 1978 when it defeated Idaho State (10-0) in Osaka, Japan. Furthermore, the last time USU began the season at home against an FCS school was in 1959 when it defeated Idaho, 14-0. All-time, USU is 212-76-12 (.727) against current FCS schools and has won nine of its last 10 such games, including each of its last five. Utah State erupted for 53 points en route to a 53-34 Homecoming win against Southern Utah on Sept. 26, 2009 at Romney Stadium as the Aggies won first-year head coach Gary Andersen's USU home debut. USU amassed 604 yards of total offense, the most since 2001 and the ninth-most in school history and reached many other milestones along the way. Most notable was the running back tandem of sophomore Robert Turbin (17 carries, 104 yards) and junior Michael Smith (eight carries, 100 yards), who became the first pair of Aggie backs to both rush for 100 yards since 1989 when Demetrius Brown (22-131) and Brett Payne (28-166) both did so at Pacific. With 108 receiving yards, Turbin also became the first USU running back to have 100-yards receiving and rushing in the same game since Emmett White in 2000. Additionally, Turbin became the first Aggie back to have three-straight 100-yard rushing outings since White in 2001. Sophomore quarterback Diondre Borel completed his first five pass attempts on the way to 15-of-21 passing for 316 yards with a career-best three touchdowns. Borel is the first Aggie quarterback to throw for 300 yards in back-to-back games since Jose Fuentes in 2002. USU had a balanced 302 yards of total offense in each half for its 604 yard output, on 259 rushing and 345 passing. SUU had 367 total offense yards (262 passing, 105 rushing), getting just 145 after halftime, as the Aggie defense held the Thunderbirds' scoreless in the fourth quarter. Quarterback Cade Cooper led SUU with 250 yards passing with three touchdowns on 24-of-48 passing. Fesi Sitake had nine catches for 98 yards with two touchdowns. Sophomore linebacker Bobby Wagner and senior cornerback Kejon Murphy had seven tackles each to lead the USU defense with Wagner notching two tackles for loss. Senior safety James Brindley and junior cornerback Chris Randle both snagged an interception. After the Aggie defense held the T-Birds to a punt, USU fumbled the return on its own 30, setting up an SUU field goal for the first score of the game. Utah State then erupted for 21 unanswered points, starting with a 29-yard pass from sophomore wide receiver Stanley Morrison to Turbin. Borel later connected with Smith for a 54-yard touchdown pass and catch. Turbin then capped the streak with a 16-yard scoring run. SUU closed to 21-17 on two touchdown passes from Cooper, but a 34-yard Chris Ulinski field goal and a 77-yard pass play from Borel to Turbin opened up a 31-17 USU advantage. SUU closed to 31-24 at the half on a Cooper to Sitake 6-yard pass with 14 seconds left. Smith scampered 40 yards for a touchdown on USU's opening third-quarter possession and later scored on a 20-yard run, alternating around SUU scores. Morrison had a 69-yard touchdown catch from Borel, and sophomore defensive end Junior Keiaho sacked SUU's Ammon Olsen in the end zone for a safety to cap the scoring. It was USU's first safety since 2003. Utah State will have nine different jersey and pant combinations, manufactured by Nike, to go along with two different helmet options for a total of 18 different uniform combinations for the 2012 season. Along with its traditional blue and white uniforms, a new pewter grey uniform will be utilized this season. Two helmet options are also available including a new diamond pattern blue and black helmet with a black face mask, along with its traditional white helmet with a blue face mask. Home uniform options feature a traditional combination of blue jersey with blue or white pants, as well as an option of blue jersey and pewter pants. Road uniform combinations can be built around the newly-designed pewter jersey or the traditional white jersey. The road pewter jerseys can be combined with pewter, blue or white pants, while white jerseys can be worn with white, blue or pewter pants. Both helmet options will also be utilized with the various uniform combinations for both home and away games. Utah State had an outstanding season offensively in 2011 as it established school records for total offense (5,945 yards), rushing yards (3,675), total points (437) and total touchdowns (60). USU's 37 rushing touchdowns in 2011 were the second-most in school history trailing the 1961 team who still holds the school record at 39. USU also rushed for more than 3,000 yards for just the second time in school history in 2011 and recorded 2,000-plus yards in each of the last three years after a 34-year hiatus from 1975-2009. Utah State averaged 282.7 rushing yards per game in 2011 to rank second all-time in school history behind the 1960 team that averaged 312.0 rushing yards per game. USU also averaged 457.3 total yards of offense in 2011 to also rank second all-time in school history behind the 1996 team that averaged 468.5 yards of total offense per game. And finally, USU's 33.6 points per game average in 2011 tied the 1997 team for second all-time in school history behind the 1961 team that averaged 38.7 points per game. Utah State's defense ended the 2011 season ranking first in the WAC and 50th in the nation in total defense (366.23 ypg), second in the WAC and 31st in the nation in rushing defense (127.70 ypg), second in the WAC and 53rd nationally in tackles for loss (5.92 pg), third in the WAC and 48th in the nation in pass efficiency defense (125.58), and third in the WAC and 59th in the nation in sacks (1.92 pg). Overall, USU's 366.2 yards allowed on defense was its best since 1998 (319.9), while its 127.8 rushing yards allowed per game in 2011 was its fewest since 1998 (123.4). Utah State's special teams ranked fourth in the WAC and 29th in the nation in 2011 in net punting (38.20 ypp), third in the WAC and 39th in the nation in kickoff returns (22.80 ypr), and seventh in the WAC and 67th in the nation in punt returns (7.81 ypr). As a team, Utah State's net punting average improved 49 spots in the nation from 2010, ranking No. 29 in 2011 with a 38.20 net average after ranking No. 78 in 2010 with a net average of 35.49. Utah State was the cardiac kids of college football in 2011 fighting back from double-digit deficits three times for wins. Its first comeback was at Hawai`i as it trailed 28-7 at the half before winning 35-31. USU then trailed San Jose State at home, 33-21, before scoring the final 13 points. Also at home, USU trailed Nevada, 10-0, before posting a 21-17 win. Overall, USU has won six games in the last two years despite trailing by double digits. Utah State gave new meaning to the phrase `Whoever has the ball last wins' during the 2011 season as seven of its 13 games were decided in the last minute of a game or overtime. Overall, USU was 4-3 in 2011 in games decided in the last minute or in overtime scoring the winning touchdown at Hawai`i (35-31) with 14 seconds to play; scoring the winning touchdown against San Jose State (34-33) with 47 second to play: defeating Idaho (49-42) in double overtime; and scoring the winning touchdown at New Mexico State (24-21) with 35 seconds to play. USU's losses at the end of games or in overtime were to Colorado State (35-34) in double overtime, at BYU (27-24) who scored the winning touchdown with 11 seconds to play and to Ohio (24-23) who scored its winning touchdown with 13 seconds remaining. Utah State was in a nation-leading 10 games that were decided by one score or less in 2011 as it began the year losing to Auburn, 42-38. USU then lost to Colorado State, 35-34, in 2OT, lost at BYU, 27-24, and lost to Louisiana Tech, 24-17, before breaking through with a 35-31 win at Hawai`i, and following it up with a wild 34-33 win against San Jose State. USU then posted a 49-42 double overtime victory at Idaho, followed by its 21-17 win against Nevada and its 24-21 victory at New Mexico State. USU ended its season with a 24-23 loss to Ohio in the Famous Idaho Potato Bowl. During the 2011 season, Utah State threw just six interceptions which was tied for the seventh-fewest in the nation at the FBS level and its four picks on defense were tied for the third-fewest in the country. Overall, USU led the nation in fewest combined interceptions both thrown and caught with 10. Utah State returns a great deal of starting experience on the offensive line highlighted by first-team all-WAC junior center Tyler Larsen(6-4, 312), and senior offensive tackles Eric Schultz (6-4, 303) and Oscar Molina-Sanchez (6-5, 299) have 64 combined starts between the three of them, including a combined 57 consecutive starts, as Larsen has made all of his 25 starts in a row, while Schultz has 19 straight starts and Molina-Sanchez has 13 starts in a row of his 20 total starts. Utah State returns one all-WAC player from the 2011 season in junior center Tyler Larsen. Larsen earned first-team all-conference honors as a sophomore and has also been named to the Rimington Trophy Watch list twice in his career. For his career, Larsen has started 25 straight games over the last two seasons, which is the longest active streak on the team. Senior quarterback Adam Kennedy will be looking to start his sixth-straight game in Utah State's season opener against Southern Utah. In 2011, Kennedy came on in relief of injured Chuckie Keeton late in the first half of the Hawai`i game and spearheaded a come-from-behind 35-31 win. Kennedy followed up that performance by starting the final five games of the season and helping USU win its last five regular-season games and become bowl eligible for the first time since 1997. In his five-and-a half games of action, Kennedy was 72-of-105 (.686) for 926 yards with 11 touchdowns and four interceptions. Kennedy averaged 154.3 passing yards in those five-and-a-half games, while also averaging 39.2 rushing yards. He also had a passing efficiency of 169.60 in those five-and-a-half games, with a season efficiency of 169.04, a mark that would have led the WAC and ranked sixth in FBS, just behind Heisman Trophy runner-up Andrew Luck at 169.69, but Kennedy only played in eight of USU's 13 games (61.5) and did not meet the minimum requirement of 75 percent participation. Sophomore quarterback Chuckie Keeton will be looking to duplicate his season-opening performance from a year ago if he starts this year's opener for USU. In his first-ever start, Keeton was named Rivals.com National Freshman of the Week as he was 21-of-30 passing for 213 yards, to go along with 33 rushing yards and two touchdowns in Utah State's 42-38 loss at No. 19 Auburn. Junior placekicker Josh Thompson set new Utah State single-season extra point records in 2011 with 57 makes in 58 attempts. Thompson also ranked fifth in school history in extra point percentage (.983). All-time, Thompson ranks fourth at USU in extra point percentage (.983), seventh in extra points made (57) and 10th in extra points attempted (58). Senior running back/kick returner Kerwynn Williams broke the WAC's career kick return yards record during the 2011 season and he enters the 2012 season with 3,349 career kick return yards. His career average of 25.3 yards per return ranks fourth all-time in school history. Williams also enters his senior season ranking fifth all-time at Utah State with 3,392 career all-purpose yards and is 1,811 yards shy of tying Louie Giammona (1973-75) for fourth all-time with 3,392 career all-purpose yards. Utah State had three players selected in the 2012 NFL Draft as linebacker Bobby Wagner was chosen in the second round (47) by the Seattle Seahawks, while running back Robert Turbin was chosen in the fourth round (106) by the Seattle Seahawks and fellow running back Michael Smith was picked in the seventh round (212) by the Tampa Bay Buccaneers. Junior running back Robert Turbin was named the WAC's Offensive Player of the Year in 2011, marking the first time in its seven years in the league and just the second time in school history that USU has had an offensive player of the year in its league joining Kendall Smith (WR) who was the Big West Conference Offensive MVP in 1988. Turbin rushed for 1,517 yards and led the WAC in scoring with 23 touchdowns and 138 points in 2011. The junior finished his career as the school's all-time leader in scoring with 308 points and total touchdowns with 51. Linebacker Bobby Wagner earned first-team all-WAC honors each of his final three seasons at Utah State and is one of just eight players in school history to be a three-time first-team all-conference selection. Wagner ended his career with 446 career tackles to rank first all-time in WAC and tied for first all-time in school history. Gary Andersen was named Utah State's 26th head coach on Dec. 4, 2008, and since that day Andersen and his staff have worked non-stop to create a culture of accountability and responsibility that would translate into success both on and off the field. And in 2011, Aggie fans saw that plan pay dividends as USU produced a 7-6 record (5-2 Western Athletic Conference) and participated in the Famous Idaho Potato Bowl, the school's first bowl game since 1997. In his first three years at Utah State, Andersen has compiled a 15-22 (.407) record including a 10-13 (.435) WAC mark as those 15 wins are the most by an Aggie coach in his first three years since John L. Smith went 16-18 (.471) from 1995-97. Furthermore, Andersen has coached 10 players who have earned first or second team all-WAC honors and six players who are currently on NFL rosters, including Michael Smith, Robert Turbin and Bobby Wagner who were all selected in the 2012 NFL Draft. That trio of Aggies drafted in 2012 is the most selections in one year since five USU players were chosen in 1980. Wagner, who was drafted in the second round (47) by the Seattle Seahawks, becomes the highest drafted Aggie since Rulon Jones was the 42nd overall pick in the second round in 1980 by the Denver Broncos. Along with playing in its first bowl game in over a decade during the 2011 season, Utah State's seven overall wins and five league victories were its most since 1993, while its second-place conference finish was its best since the 2000 team ended the year second in the Big West. Furthermore, those five league wins in 2011 were tied with five other teams (1953, 1960, 1990, 1991, 1993) for the most in school history, while its seven overall wins are tied for the 10th most all-time at Utah State. Utah State also won its final five games of the regular season in 2011, which is tied for the eighth-longest winning streak in school history and the longest since the 1993 squad won its final six games of the year. USU's three-win turnaround from four wins in 2010 to seven wins in 2011 was among the top 15 in the Football Bowl Subdivision for the year. During the 2011 season, Andersen's high-octane spread offense was statistically one of the best in the country as it led the WAC and ranked sixth in the nation in rushing offense (282.69 ypg). USU also ranked first in the WAC and 18th in the nation in passing efficiency (151.8), first in the WAC and 23rd in the nation in scoring offense (33.62 ppg), second in the WAC and 20th in the nation in total offense (457.31 ypg), and second in the WAC and 33rd in the nation in fewest sacks allowed per game (1.38 pg). In 2011, Utah State also established school records for total offense (5,945 yards), rushing yards (3,675), total points (437) and total touchdowns (60). Highlighting Utah State's offense in 2011 was junior running back Robert Turbin who ended the season as the WAC's Offensive Player of the Year, USU's first in its six years in the league, and just its second such offensive award in school history. During the season, Turbin ranked first in the WAC and eighth in the nation in scoring (10.62 ppg), second in the WAC and 13th in the nation in rushing (116.69 ypg), and sixth in the WAC and 40th in the nation in all-purpose yardage (129.85 ypg). He ended the year setting single-season school records for rushing touchdowns (19), total touchdowns (23) and points scored (138), while his 1,517 rushing yards rank third all-time at USU for a single-season. Turbin, who was drafted in the fourth round (106) of the 2012 NFL Draft by the Seattle Seahawks, ended his Aggie career ranking first in both total touchdowns (51) and points scored (308), while his 3,315 career rushing yards ranks fifth all-time in school history. Andersen's defense was also formidable during the 2011 season as it ended the year ranking first in the WAC and 50th in the nation in total defense (366.23), second in the WAC and 31st in the nation in rushing defense (127.70 ypg), second in the WAC and 53rd nationally in tackles for loss (5.92 pg), third in the WAC and 48th in the nation in pass efficiency defense (125.58), and third in the WAC and 59th in the nation in sacks (1.92 pg). Utah State's top defensive player in 2011 was Wagner who earned first-team all-WAC honors after ranking first in the league and eighth nationally with 11.31 tackles per game. Wagner, who is one of just eight players in school history to be a three-time first-team all-conference selection, ended his career with 446 career tackles to rank first all-time in WAC and tied for first all-time in school history. Along with all of his Utah State accolades, Wagner also received some national exposure after being named the Most Valuable Player of the 2012 Senior Bowl, leading the North to a 23-13 win. Smith was also recognized for his performance in the Players Classic All-Star Game as he was named the North's Offensive MVP. Other Aggies to earn first-team all-WAC honors under Andersen's tutelage include offensive linemen Philip Gapelu (2011) and Tyler Larsen (2011), while those who have been named to the league's second-team include defensive end Levi Koskan (2011), tight end Tarren Lloyd (2011), defensive back Curtis Marsh (2010) and Turbin (2009). Along with all of Utah State's success on the field under Andersen, there has been just as much success in the classroom as 66 Aggies have earned academic all-WAC honors, while another 84 have graduated from the University. Furthermore, Utah State had 18 football players earn academic all-WAC honorees this past year to rank first in the conference. Andersen came to Utah State after five seasons as the assistant head coach, defensive coordinator and defensive line coach at Utah, where he helped guide the Utes to a 13-0 record in 2008. Utah finished the season ranked No. 2 in the Associated Press poll after winning the BCS Sugar Bowl with a dominating 31-17 victory against Alabama. In 2008, Andersen was named a finalist for the Broyles Award, honoring the top assistant coach in college football. He was also named a Rivals.com top 10 non-BCS recruiter in 2008 and tabbed as the No. 1 non-BCS recruiter by Rivals.com in 2005. Overall, Andersen spent 11 seasons as an assistant coach at Utah after coaching for the Utes from 1997-2002 before becoming the head coach at Southern Utah in 2003 and then returning to Utah in 2004. During his tenure at Utah, Andersen was a part of seven winning bowl teams, including two BCS Bowls as Utah went 12-0 in 2004 and won the Fiesta Bowl, along with its perfect record and Sugar Bowl win in 2008. During his tenure at Utah, Andersen coached 14 first-team all-conference players (three in 2008), including two Mountain West Conference Defensive Players of the Year in John Frank (1999) and Eric Weddle (2005 and 2006), as well as a consensus All-American in Weddle in 2006. Andersen also coached 10 Ute players drafted in the NFL in Richard Seals, John Frank, Lauvale Sape, Sione Pouha, Jonathan Fanene, Eric Weddle, Paul Soliai, Sean Smith, Brice McCain and Paul Kruger, in addition to several other players who made NFL rosters as free agents. Andersen's coaching career began in 1988 as the assistant head coach and offensive coordinator at Southeastern Louisiana, where he coached for one season before going to Ricks College (now BYU-Idaho) from 1989-92 as the offensive line coach. His other coaching stints include Idaho State (1992-94, defensive line), Park City HS (1994-95, head coach) and Northern Arizona (1995-96, assistant head coach/defensive line/special teams). A 1986 graduate of Utah, Andersen earned his bachelor's degree in political science. He played center for Utah from 1985-86 after garnering first-team junior college All-American honors in 1984 at Ricks College. Andersen is married to the former Stacey Lambert, and they have three sons: Keegan (21) and twins Chasen and Hagen (17). Keegan is currently a sophomore tight end on Utah State's football team, while Chasen and Hagen are both seniors at Logan High School. Andersen's brother, Mark, is USU's director of football operations.